Steps: What Will Consume You? This past week I was mad at God. I’m just going to lay that out there in all its honesty. It wasn’t pretty, as anger typically isn’t, but it also wasn’t unfounded. And it definitely did not come as a surprise to Him. At first I didn’t want to admit it. I tiptoed around the subject, speaking to the feeling with all the right words because I knew it was the right thing to do, but I didn’t deal with it. When that didn’t work, I focused on other places as the root of the issue, aiming my anger there instead. Not that I acted out, no, I simply kept the anger to myself unwilling to face it head on or let it out because…well…the idea that I was mad at all seemed like something I shouldn’t feel. But here’s the thing. God can handle our anger. He gets angry himself. Anger is not a sin. It’s what we do with it that can become sin. When we hold it inside, refusing to talk about it and allowing bitterness to take root, that is when sin enters the picture. Friend, a relationship with God is like no other relationship we have and yet the same all in one breath. One facet that mimics other relationships—really is the key to them—is communication. I spoke a little about our need for regular chats with God last week. Communication must happen for us to grow in Christ. We cannot shut Him out or ignore a problem when it arises because we are scared to reveal our true feelings to Him. Spoiler: He already knows them because He already knows us that intimately (Read Psalm 139 to see this). Our thoughts are not hidden from Him! And as long as we continue to work through our emotions with Him, we’ll be okay. I started by unloading on my husband. Sometimes having that physical listening ear can start you talking. But in the end it was God who I most needed to speak with. I needed to open my mouth and let out the frustrations hammering away at my heart. And they were understandable issues driving my anger. I’m sure I’m not the only one who’s ever experienced this. We are going to get mad at God from time to time. It’s normal. Think of it this way. How many of you are parents? Our children don’t always like the decisions we make, but they are always made out of love and typically from a larger vantage point than our children have. We make them because we see a bigger picture, and we have their safety and best interests at heart. Yet in the moment our children don’t like us for it. Well, our relationship with God is much the same, and we have to trust that He loves us too much to always keep us happy. If happy-in-the-moment takes us away from His best, then guess what? God isn’t going to choose that. He’ll chose what is best for us, even if it upsets us sometimes. And when He does, we have a choice. 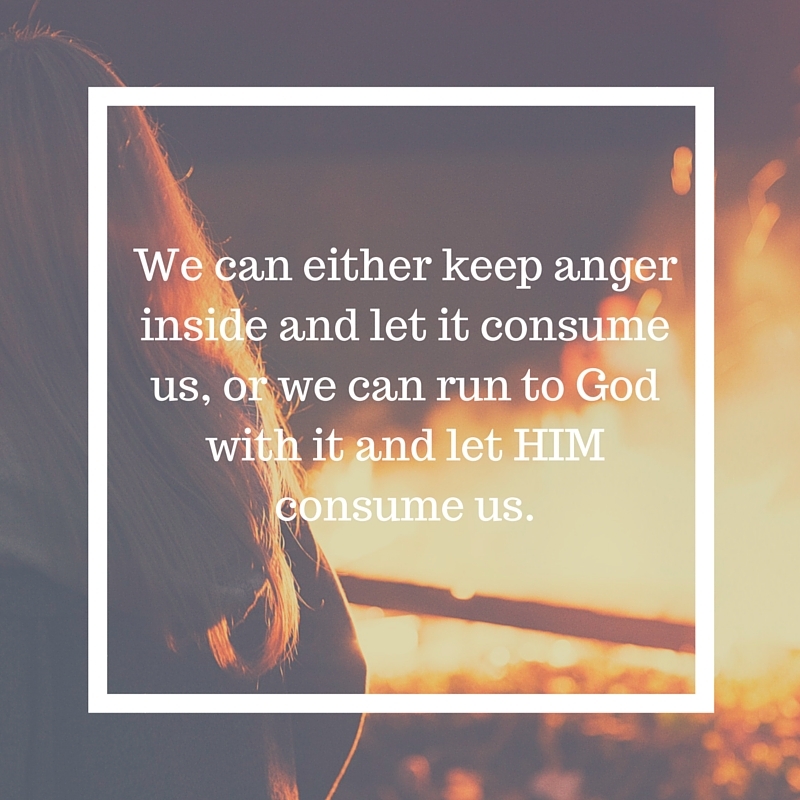 We can keep that anger inside and let it consume us, or we can run to God with it and let Him consume us. It might have taken me the better part of a week, but I finally found myself speaking honestly with Him. He didn’t get upset. He didn’t act surprised. And He didn’t pull the silent treatment in response. Instead He gathered me in His arms, shouldered my anger, and began to heal my heart from it. He’s waiting to do the same for you. All you have to do is start talking. He’ll listen. 1. I just bought curtains that match your blog design...love that combo. 2. Waaaay back in the day, I used the phrase "What Consumes You?" as my tag line. Fun story regarding that at a later date.